Anthropogenic carbon dioxide has been accumulating in the oceans, lowering both the concentration of carbonate ions and the pH (ref. 1), resulting in the acidification of sea water. 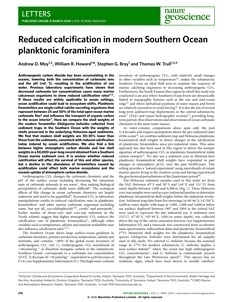 Previous laboratory experiments have shown that decreased carbonate ion concentrations cause many marine calcareous organisms to show reduced calcification rates2� If these results are widely applicable to ocean settings, ocean acidification could lead to ecosystem shifts. Planktonic foraminifera are single-celled calcite-secreting organisms that represent between 25 and 50% of the total open-ocean marine carbonate flux6 and influence the transport of organic carbon to the ocean interior7. Here we compare the shell weights of the modern foraminifer Globigerina bulloides collected from sediment traps in the Southern Ocean with the weights of shells preserved in the underlying Holocene-aged sediments. We find that modern shell weights are 30�% lower than those from the sediments, consistent with reduced calcification today induced by ocean acidification. We also find a link between higher atmospheric carbon dioxide and low shell weights in a 50,000-year-long record obtained froma Southern Ocean marine sediment core. It is unclear whether reduced calcification will affect the survival of this and other species, but a decline in the abundance of foraminifera caused by acidification could affect both marine ecosystems and the oceanic uptake of atmospheric carbon dioxide.